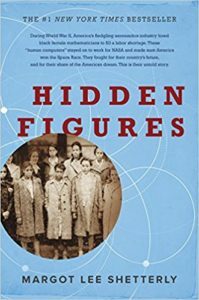 Between the movie and the New York Times Bestseller list, Hidden Figures (2016) by Margot Lee Shetterly had generated a fair bit of buzz. I knew I wanted to read it. It was just a matter of getting it from the library when everyone else wanted it too. I knew going in that this book focused on the contribution that black women made in the space race. This knowledge came solely from the film preview, but I was interested in reading the source material. I still haven’t seen the movie, but I got the idea from seeing the preview that the book would focus on the lives of three women and their contributions to NACA and NASA. This was somewhat misleading because Shetterly’s book covers a lot more ground than I supposed. She covers over twenty years of history at NACA and NASA and discusses many more than three different women. As I began to read, I kept trying to figure out which three would be the most prominent ones. What made this even more difficult is that I accidentally lost the book in the middle (by accidentally turning on my Kindle’s wifi and returning it). Then I had the long wait again to get the book back. By the time I began reading it again, I was having even more challenges remembeing who was who and what they’d done earlier on in their lives. Even with the challenges of keeping everyone straight, I thought this was a very good book. Shetterly does a good job of reminding us what it was like as a black woman in the South between the 1940’s and 1970’s. “Hotels in the South denied service to black patrons; blacks of all social strata knew to make arrangements with friends and family, or even strangers known for opening their homes to guests, rather than risk embarrassment or possibly danger while traveling.” (117) Education, traveling, and earning a living were all deeply circumscribed by segregation. Shetterly told story after story of black women who were ridiculously smart, with advanced degrees in math and science, and most often their only career option was a teacher. The women in this book, given the slightest chance, were able to provide for their families and make significant contributions to space travel. Shetterly did a very good job in showing the incredible hurdles they had to overcome just to get near the action. “The electrified fence of segregation and the centuries of shocks it delivered so effectively circumscribed the lives of American blacks that even after the current was turned off, the idea of climbing over the fence inspired dread.” (196) Because of racism, segregation, and unequal opportunity, this country squandered (and continues to squander) unimaginable talent. Just think of what we could accomplish if everyone had the opportunity to be their best. Share the post "The women behind the space program"